I hope we didn’t miss your favorite place for a slice. If we did let us know! Described as one of the best in Charlotte for its amazing, thin crispy crust pizza and their farm to table fresh approach. 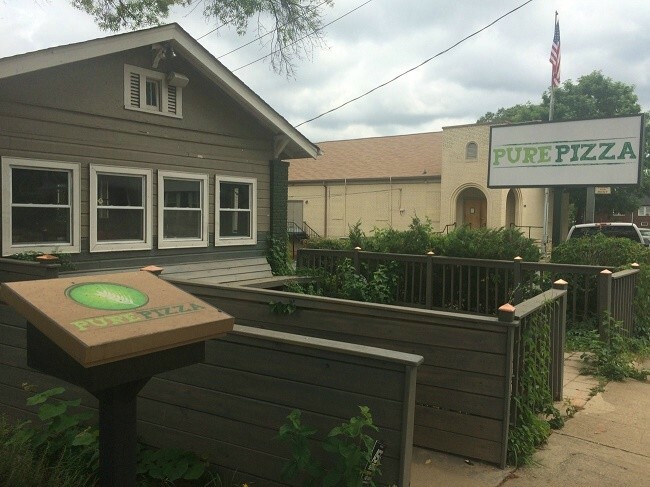 Located on the 7th Street Public Market, Pure Pizza got its name from its holistic pizza philosophy which involves a revolutionary sprouted ancient grain crust and farm-fresh ingredients. The selections are creative and unique. Outstanding server and quaint setting. They also have a very original selection of toppings. Definitely try the mozzarella with chorizo, topped with radish, cilantro and a squeeze of lime. Fantastic! The simple mozzarella with home-made pesto is out of this world. Located at the corner of 7th St, a casual, unpretentious space-some outdoor seating in a lovely part of town. This place has grown into an essential component of the neighborhood, due to the fact that Hawthorne’s has a lot of family and kid-oriented nights and specials. Relaxed family atmosphere, tasty food, friendly service & perfect location. If you get a chance and feel on the wild side, order the fried cheesecake for dessert. Awesome! A restaurant located inside the Stonecrest Shopping Center, True Crafted is a reimaged pizza joint with something for everyone. From their signature oven baked pizza’s to their grilled pizza’s, freshly prepped ingredients and there are no pre-made pizza. You will truly enjoy the authentic Italian pizza with all your favorite toppings. Add to that, they offer a great beer selection as is their selection of Italian wines. This is a very casual place, but great for date night or family get–togethers. The home of the “Virginia Slice” named after where the business began. It has now moved over to North Carolina to offer Charlotteans the chance to get their hands on that whopping 28in round pie that made Benny’s famous. Benny Pannello’s is a pretty cool joint, definitely a good stop during a bar crawl or just any day you are craving pizza. The place is great, the concept is super simple. Gigantic pizza by the slice for only 5 bucks. Get a whole pie if you need to feed the Brady bunch. Just be careful. The box won’t fit in your car. You’ll need a few bungee cords to strap it to the roof! Brixx Wood Fire Pizza is located in the Stonebridge Shopping Center. Their claim to fame being their brick ovens which “enhance the natural flavors of our quality ingredients, giving our pizza that amazing, wood-fired taste.” Brixx also tries to appeal to all types of eaters by providing various dietary needs, vegan and vegetarian options, whole wheat crust, and gluten-free menu items. They have a good selection of salads, sandwiches and pizzas. As for pizza toppings, they have plenty of choices, combinations and various vegetarian toppings. It makes a great place for couples, groups and families. This European style restaurant serves hand-tossed pizza and traditional Serbian dishes. Intermezzo offers absolutely fantastic food, authentic Greek/Serbian cooking with American alternatives provided, great drinks and great service. Not only are the servers outgoing and friendly, it is a yuppy dive fun look. Guy Fieri from the Food Network spotlighted this restaurant for its affordable, authentic and wholesome experience that simply satisfy all palates. It is highly recommended to anyone looking for an ethnic experience. Dupont Realty would love to hear from you. If you have any comments or ideas we can share with our clients, please get in touch. If you have a question for our Real Estate Team, please email us. Your answer may be part of our next blog article.